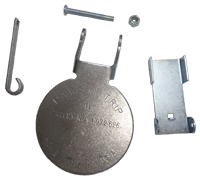 Paws-I-Trip pan tension kits are easily attached to conventional traps to provide automatic tension. Audible set point, minimal pan creep and no pan wobble. Tension is easily adjusted by bending the special dog up or down. Simple to install, no special tool or welding. Please give trap make and model. PIT-01 (Medium Pan): Fits most #3 and #4 Double Long Spring traps including #3N Victor DLS. PIT-07 (Large Pan): Fits Bridger #5 DLS and #44 B&L DLS. PIT-09: Fits Bridger #2 and #3 Coils, and NW #2 and #3 Coils. PIT-11: Fits #3 Soft Catch Coils. PIT-13: Fits Victor #3 Coil Spring. Fits all coil-spring and long spring traps. The easiest way to raise or lower trap pans. Just slip the adjuster over the traps crossframe where the dog is attached. To raise the pan pull away from the trap adjusters handle. To lower the pan push the adjusters handle toward the trap. Precision cast from tool steel and zinc plated to resist rust.